IAB reader Ritisha Sankar has shared spy pictures of the Ford EcoSport facelift that fully reveal details of the final version. The 2018 Ford EcoSport is reportedly slated for launch on November 9. It will become the car's first major update since its launch in June 2013. Ford will add a new range-topping Titanium S trim to the EcoSport lineup. It features darker 17-inch alloys, darkened grille, and black headlamp bezels. The images captured are that of one of the top end Titanium or Titanium S trims of the EcoSport. The dashboard gets an all-black treatment along with orange highlights around the centre console and on the door trim. Visible in the spy pictures is the redesigned centre console that now gets a floating touchscreen for the SNYC 3 enabled infotainment setup. There are two USB ports available placed just below the updated aircon controls. Also present is a new steering wheel and instrument console. The latter, unlike the hooded dials of the outgoing model, features a much simpler setup along with a MID placed between the tachometer and speedometer. 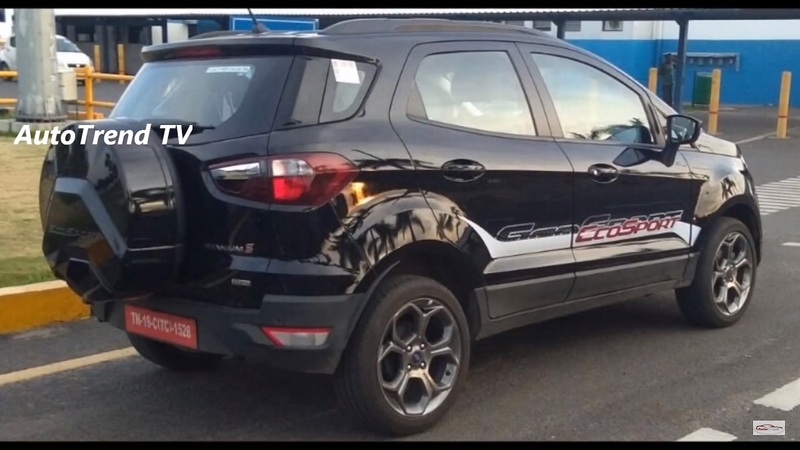 The exterior spy pictures of the 2018 Ford EcoSport reveal three alloy wheel designs. The one in black is the range-topping Titanium S trim and features dark 5-spoke rims. The visibly smaller 7-spoke alloys are likely to be available with mid-level trims. The Titanium S trim also features decal on the side indicating that dealer level customisation options will be offered. The existing 1.5 L Ti-VCT petrol engine will get replaced by a new 3-cylinder 1.5 L petrol from the Dragon family. The engine produces 123 PS of max power and 150 PS peak torque. Ford EcoSport diesel will continue with the 1.5 L TDCi unit, while the presence of the 1.0 L EcoBoost petrol is yet to be confirmed.